make-up, hairstyles and vintage weddings. Finally, after a couple of years searching shops and the internet this was one of several books we finally found. This is a must buy book for anyone planning a 1940's wedding with advice for both the Bride, Groom and Bridesmaids, as well as details of invitations, food & drinks, music and much more. The book covers each decade from 1910 to 1950 and whilst being American it will give British couples lots of useful information and ideas to help make their wedding day as individual and special as possible. 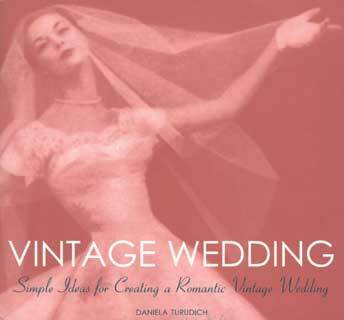 Vintage wedding has 176 good quality gloss pages of useful information, illustrations, photographs and tips which will certainly be useful and thought provoking for anyone planning a vintage wedding. It would be great to see a book dedicated to British weddings but in the mean time, I haven't seen any other book that comes close.